Shape memory and superelastic alloys possess properties not present in ordinary metals meaning that they can be used for a variety of applications. Shape memory and superelastic alloys: Applications and technologies explores these applications discussing their key features and commercial performance. Readers will gain invaluable information and insight into the current and potential future applications of shape memory alloys. Part one covers the properties and processing of shape memory effect and superelasticity in alloys for practical users with chapters covering the basic characteristics of Ti-Ni-based and Ti-Nb-based shape memory and superelastic (SM/SE) alloys, the development and commercialisation of TiNi and Cu-based alloys, industrial processing and device elements, design of SMA coil springs for actuators before a final overview on the development of SM and SE applications. Part two introduces SMA application technologies with chapters investigating SMAs in electrical applications, hot-water supply, construction and housing, automobiles and railways and aerospace engineering before looking at the properties, processing and applications of Ferrous (Fe)-based SMAs. Part three focuses on the applications of superelastic alloys and explores their functions in the medical, telecommunications, clothing, sports and leisure industries. The appendix briefly describes the history and activity of the Association of Shape Memory Alloys (ASMA). 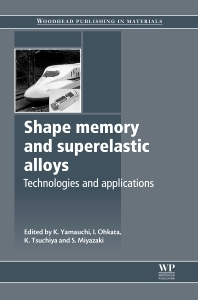 With its distinguished editors and team of expert contributors, Shape memory and superelastic alloys: Applications and technologies is be a valuable reference tool for metallurgists as well as for designers, engineers and students involved in one of the many industries in which shape memory effect and superelasticity are used such as construction, automotive, medical, aerospace, telecommunications, water/heating, clothing, sports and leisure. Dr Kiyoshi Yamauchi works in the Innovation of New Biomaterial Engineering Center at Tohoku University, Japan. Dr Ichizo Ohkata works for Piolax Medical Devices, Inc, Japan. Dr Koichi Tsuchiya works in the Hybrid Materials Center at the National Institute for Materials Science, Japan. Professor Shuichi Miyazaki works in the Institute of Materials Science at the University of Tsukuba, Japan. All four editors are members of the Association of Shape Memory Alloys (ASMA) and are widely renowned for their research expertise in the development of functional metallic materials, shape memory and superelastic alloys.